Drag – gay pageantry – and the gay community…. 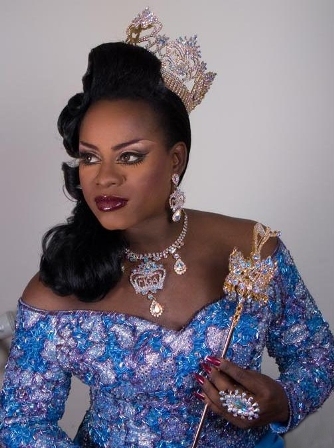 Check out today’s Pageant Soup Podcast Show – We talk about drag vs gay pageantry vs the perception the mainstream LGBT community has about drag and pageantry. Are they different, are they the same and why don’t more gay people support gay pageantry. Their is a huge subculture out there (a huge world) we call gay pageantry. There are major shows, thousands of dollars spent and reputations at stake. Yet there is a huge segment of our gay population that has no clue or does not understand the art form of female impersonation and male lead. 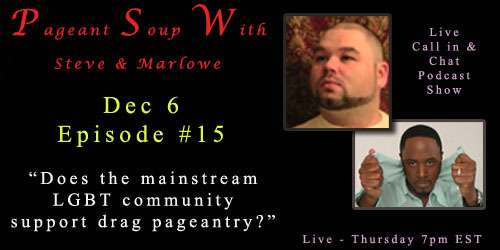 Today’s Pageant Soup Podcast show will talk about the divide and how we can bridge this gap (whether real or not). Many of you that read this blog don’t follow gay pageantry. I would love to hear your opinions on the matter. Tell me what your opinion is of drag and of gay pageantry, do you support it, do you know much about it and would you go check out a show if you had the opportunity. Leave your comments here!!!! LISTEN EVERY WEEK TO THE SHOW LIVE – THURSDAY – 7 PM EST AT: www.blogtalkradio.com/ccemedia. You can call in with your comments or chat live with us. As a Gay man who also is a Transvestite — something which conventional wisdom claims is mutually exclusive, though my personal experience tells me that the truth is the exact opposite. I an also a Drag enthusiast, I have long been enamored of the world of Drag. I find it neither insulting nor indulging in stereotypes. I have attended several Gay Pageants and have never been less than charmed. Very much applaud your effort in trying to bridge the gap between drag and “perceptions” of drag. Great good luck and thank you! Thanks for your comment and I hope you liked the show. We hope we are doing our small part for the gay community. It’s funny when I look at how our community has suffered so much discrimination and then we turn around and discriminate against each other – it is very disappointing. Hopefully we can break down some of those stereotypes and give people room for pause. It is odd, isn’t it, that Gays, who have known so much discrimination (and still do, alas), would discriminate against others, no matter what the situation. I know that, after having appeared in various CD/TV magazines and vids, en femme, I went public that I am Gay, I ran into some heat. It seems that the CD/TV arena wants to be perceived as het, not Gay. Not sure why this should be. When I do shoots now for TV magazines or on the net, I demand that I be identified as a Gay transvestite. But long live Drag! It’s fun. the ladies are gorgeous … what more to ask?